We have been in this house for six years now. I can’t believe it. For the past few months I’ve been thinking it is time for a change-up. I thought about redecorating my college age daughter’s room. You know kind of make it a little more grown up. When I mentioned it to her, she sighed and asked that I didn’t do anything. I’ll wait. 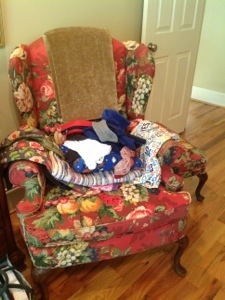 Then this little flowered chair kept calling out to me. A year ago, I took her sister and recovered her. She resides in my dining room. I actually sewed that baby! I had absolutely NO idea what I was doing, but plugged along. Of course if you look closely, even at far away, you can see all the imperfections. I’m ok with it, because she sits in a corner behind the table. After the countless hours and back breaking pinning, cutting, fitting and sewing, I knew I didn’t want to do that again. And actually I couldn’t figure out what fabric to use. I, even, sent off for samples of fabric for a slip cover. They didn’t really hit the mark either. 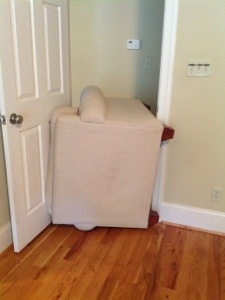 Then, as I was taking a shower at my sister’s last week when I was visiting her, I had a brilliant idea! 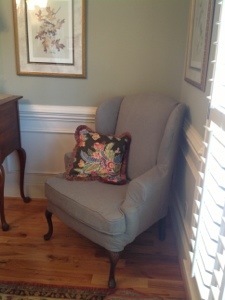 Switch the flowered chair with the club chair from the bedroom! Right now it only holds clothes and what-not. 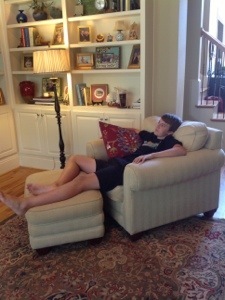 Does anyone else have a chair like that? It never gets sat on, just holds stuff? Easy! Just switch them out. Uhhhh, maybe not so easy. But being as brilliant as I am, I took the feet off and it slid right out. I moved the flowered wingback into its place in the bedroom. Oh My! 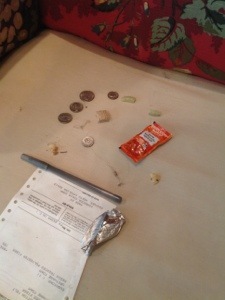 Look what we have here…a pen, crumbs, taco sauce and 55 cents. And yup! It holds all my miscellaneous stuff. 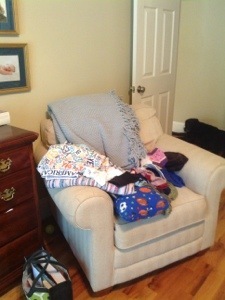 Thomas smartly advised that I could actually use the chair to sit on if I would put my stuff away. Oh Reeally now.?. 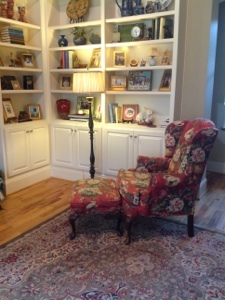 And this is the club chair’s new home. Nice. I like it. And it cost me $0! 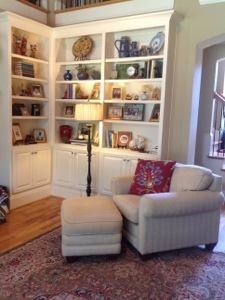 Posted on July 15, 2013 by mary •	This entry was posted in Home and tagged decorating, re-do. Bookmark the permalink.